Moshe is the Canary Wharf Multifaith Chaplaincy’s dedicated rabbi. In his role, he supports the broader Chaplaincy team offering pastoral care to professionals working on the Canary Wharf estate. He also meets regularly with companies on the Estate to offer advice around fostering diverse and inclusive work environments. Moshe joined the Chaplaincy in October 2012. In addition to his role at the Chaplaincy, Moshe is the community rabbi at the New West End Synagogue in Bayswater. Here he supports around 200 families through major life cycle events such as birth, Bar and Bat Mitzvah as well as marriages and deaths. Aside from offering pastoral care, Moshe also runs a variety of educational programmes, supporting the practical religious and spiritual needs of the community. Moshe and his wife have ten children – including twins. He was born and grew up in Kingston-upon-Thames and studied degrees in Medical Electronics and holds a PhD in Medical Physics from the University of Surrey. 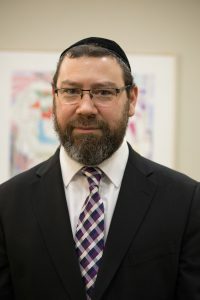 He learned seminary in Jerusalem and was first appointed as a rabbi in 2009. Moshe enjoys reading in his spare time across subjects of physics, sociology, psychology and philosophy. He and his wife run a non-profit organisation called Kol HaNearim, meaning ‘All the children’ for pairing up volunteer tutors and children from single parent families to help them prepare for their Bar and Bat Mitzvahs and Jewish studies in school.